If your clients are obsessional about their weight to the point where others tell them that they are already painfully thin and yet they don't believe them then it is possible that they are suffering from Anorexia Nervosa. People with Anorexia often have a distorted body self-image, however there are usually more complex issues going on in their lives. If your clients have been diagnosed with Anorexia then it's possible that they will resist treatment (unless they are in the frame of mind to want to overcome their eating disorder). It doesn't help to see exceptionally slim celebrities that are portrayed by the media every day if clients don't already feel good about themselves - however fashions come and go - the main thing to concentrate on is regaining natural health and vitality. 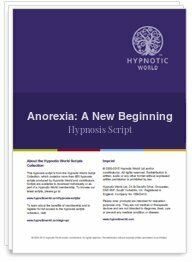 This Anorexia - A New Beginning MP3 download is designed to help your clients to do just that - embark on a journey of discovery and start enjoying life and achieve their true potential.